Tri-C is Ohio’s first community college, and the state’s oldest and largest public community college. It offers more than 1,000 credit courses and more than 190 career and technical programs. Tri-C’s reach spans the county, with three campuses beyond its downtown Cleveland hub, two Corporate College locations, and the Hospitality Management Center in Cleveland’s Public Square. As the state’s largest community college, Cuyahoga Community College (Tri-C) attracts students from around the region who attend classes at multiple campuses. Businesses utilize Tri-C facilities for professional development and events. 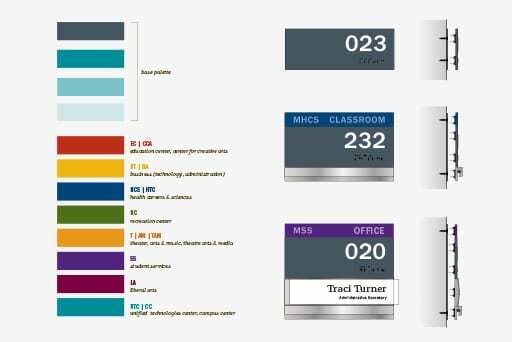 The diverse and often transient nature of the population visiting Tri-C called for a clear, consistent wayfinding strategy with an updated signage program to improve navigation inside the buildings. Thorough experience audits of Tri-C’s main, east and west campuses included tours and travel path analyses in order to accurately document traffic flow and determine how separate audiences (students, visitors and staff) accessed spaces on campus. A color-coded sign program was developed to provide visual cues in combination with building numbers. Together, these elements simplify the information people need to find their way, and it is especially helpful for connected buildings on campuses. That way, people can recognize they are entering a new building even if they aren’t going outside. A nomenclature scrub resulted in a standard for consistent naming across campuses to reduce confusion. Rather than changing room numbers (which would require a system-wide overhaul), a modular system was recommended, with easily changed components for versatility. These signs combine the old number system (assigned by the building architect) with new, color-coded signage and naming.